My chickens love milk. Really! Milk! I found that to be a surprise, but then again, thinking back to the "old fashioned" way of farming, it was quite typical for farmers to give the first bit of their cow's milk to the barnyard animals. I guess I just always thought that it would go to the kittens, goats, or other large animals. After reading in a book that milk was not only good for chickens (the calcium is needed for strong egg shells) but they enjoyed it as a treat, I just had to see for myself....and sure enough! They love it! 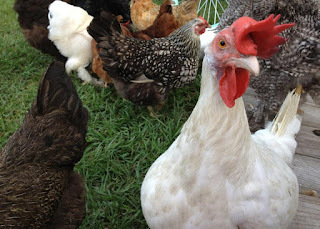 So what fun treats do your chickens enjoy?